Been thinking about revival lately. 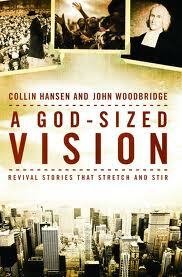 I’m slowly reading through A God-Sized Vision: Revival Stories That Stretch and Stir by Collin Hansen and John Woodbridge and I sense a stirring. I’m not exactly sure what is stirring up, but I’m pretty sure it’s the Lord working through this book. The stories are amazing. Critics are unable to slow the progress of true revival as the Holy Spirit empowers His people to move forward. Scripture is a foundational authority through revival. Jesus is seen as Christ and Lord. People are convicted of sin and seek for salvation (through Christ!). People are baptized (as believers!). Fascinating stuff to consider when you’ve been told much of your life that revival is only experienced with “weird manifestations.” Hmm. I think a great picture of revival is what happened in the verses following that: The believers devoted themselves to biblical teaching, loving fellowship, prayer, sharing meals, meeting each others’ material needs, all of which were accompanied by signs, wonders, and daily multitudes saved.